Making A PMC Filigree Heart Using Syringe Metal Clay And Cork Clay. A pmc filigree heart made from precious metal clay applied with a syringe around a core of cork clay. During the process the cork clay will be burnt out leaving a hollow filigree metal clay heart. Cork clay enables hollow form pmc jewelry to be made in various styles and shapes. This heart is made from PMC 3, it can also be made with art clay silver. Syringe clay work allows you to use your creative side and gives you the freedom to play around with designs. It's not just used to add embellishments to pieces or to stick pieces together! Step 1 - take a piece of cork clay and roll it into a smooth ball in the palm of your hand until smooth. Step 2 - gently roll it out to approximately 3cm thick or whatever thickness you prefer for your piece. Step 3 - you can either use a metal heart cutter to press into the clay to make your heart, use a stencil and cut it out with a craft knife or cut one out freehand. A metal cutter was used for this project. Step 4 - leave the cork clay heart to dry either naturally if you are not in a hurry or very slowly on a cup warmer but whatever way you do it, it MUST be completely dry. Put a toothpick into the dry cork shape so that you have something to hold on to whilst you are putting the clay on. Squeeze the clay down into the tip of the syringe. Hold the toothpick or place it in the piece of polystyrene foam and squeeze the syringe until the clay starts to flow. Create any design you like making sure that the clay overlaps especially on the edges. Be sure that you keep the syringe, tip down, in a cup of water to stop the clay drying out. You don't have to do the syringe work all at once; you can continue to syringe clay over either a few hours or days. Either dry your piece with a hairdryer, or leave it standing in the polystyrene foam to dry naturally. Once dry place it in a heat proof ceramic crucible with vermiculite, this method is used to support the heart and to prevent flat spots occurring, place in the fusing kiln. It must be noted that when burning out cork clay you can only fire the piece in a kiln as it gives off dangerous fumes. Always fire at approximately 1472° F , the cork burns hot and might cause silver to melt if fired at a higher temperature. Once fired let the piece cool naturally then gently brush with a wire brush for a matte finish or place in a tumbler for a high finish. Attach a chain either with silver jump rings or gently drill a hole and thread the pmc filigree heart on a chain as I did. 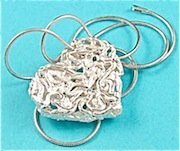 Visit Silver Jewelry Clay at Delphi Glass for a large range of metal clay tools and supplies.